I’ve been throwing around the idea of customized or instrumented menstrual cups for a while. Menstrual cups, typically made of medical-grade silicone, are cups that catch the blood flowing out of the cervix and typically only need to be emptied twice a day. They are flexible so you fold them and they open on insertion. They exist in collapsible, ball-valve, and other forms. Some of my friends like the concept of menstrual cups, but have various problems with removal and leakage. I speculate that custom cups could help, although more analysis is needed to determine the cause and the variation. Hence this project. I also really like the idea of an citizen science project measuring variation in periods. Other people claim a Diva cup is supposed to hold half your period’s worth of blood — I definitely bleed at least four cup-fulls during my period, so I wonder if my bleeding is heavy. If lots of people contributed data, we could see whether it varied by ethnicity, age, body weight, etc. It would be a ton of fun! I was beaten to the punch on instrumented cups, but I think there is still room for improvement (or at least an open-hardware version). 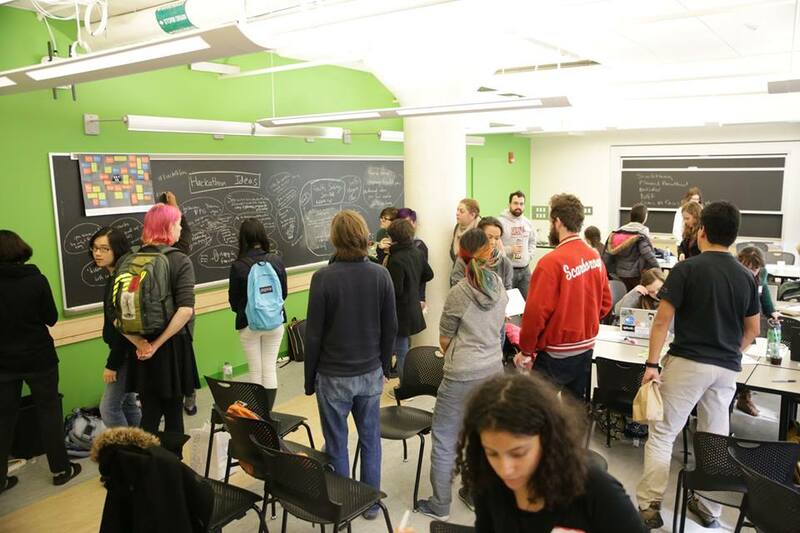 This past Saturday I ran a hackathon for feminism (website here). 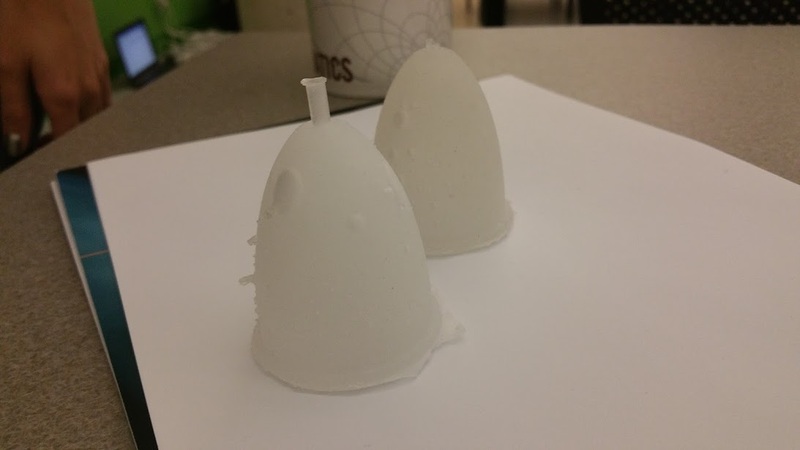 Before the hackathon, John and I made menstrual cup molds and cast menstrual cups. We modeled it in Solidworks, then intersected it with a rectangular prism and split the prism in half. 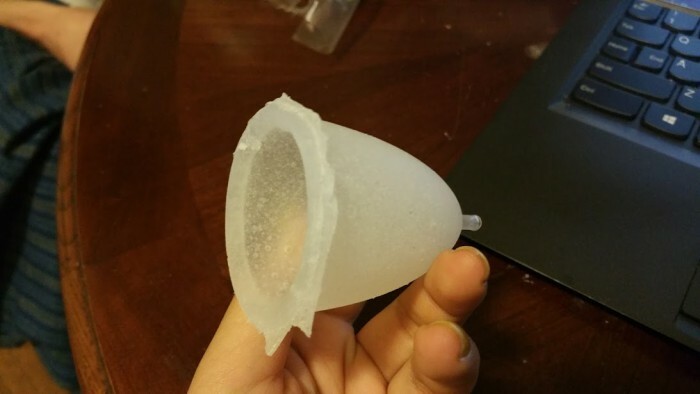 This created a two-part mold with a cavity in-between the size and shape of the menstrual cup. 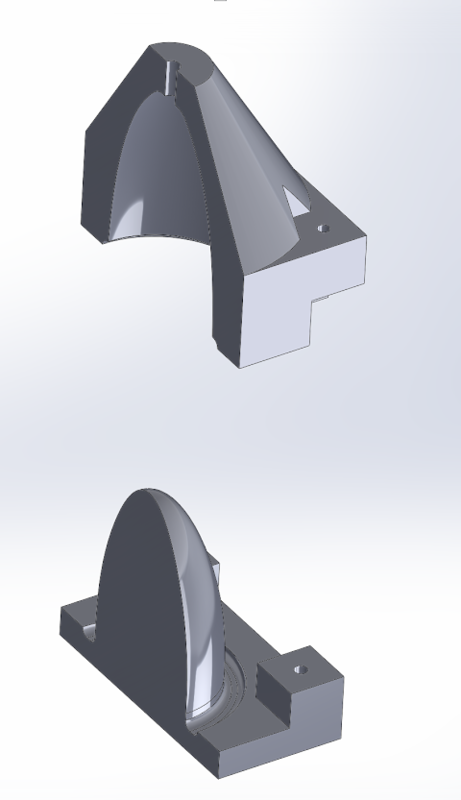 The Solidworks 2015 files are available here and are CC-BY-SA (c) John Aleman. We then printed these out on a Stratasys printer, melted the wax support material off in the toaster oven, cleaned off with isoproprly alcohol, and had our molds. I first tested it at home with John’s help. 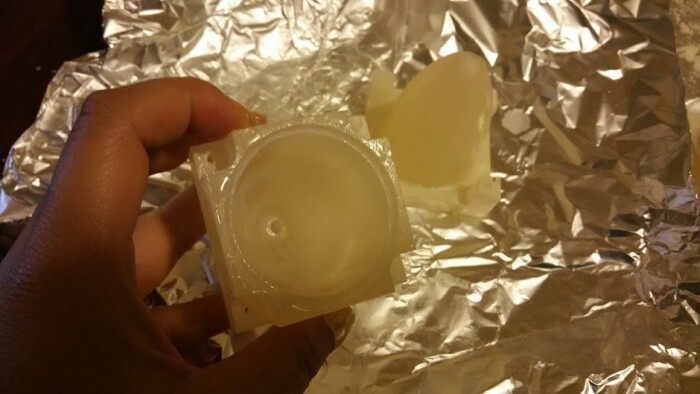 We used Smooth-On’s SORTA-Clear Translucent Silicone Rubber, shore 37, since it cures in 4 hours instead of 24 hours. This is food safe and I think body-safe — I would call Reynold’s Advanced Materials to double-check before actually using one of these cups. Turns out this material was really difficult to work with… it was the consistency of viscous snot. No pictures pre-hackathon since the silicone is messy. I sure had a difficult time separating the molds. And it turned out we hadn’t even filled the molds for two of them! 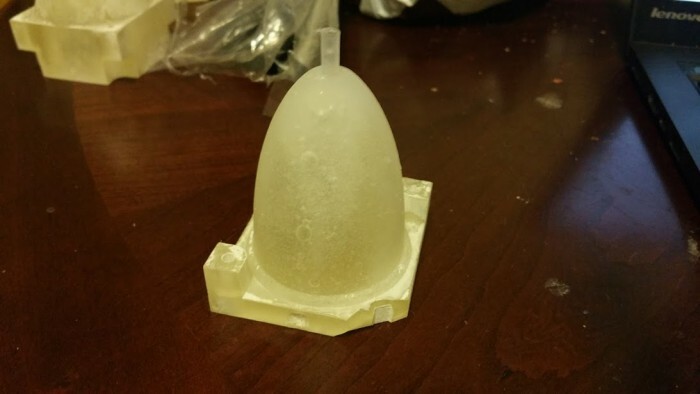 Eventually some careful prying by my friend Nadya, we opened the final mold to find a menstrual cup inside! It had a lot of bubbles — would have benefited from 2-3 minutes in a vacuum. Unfortunate, since there doesn’t seem to be a cheap hobbyist vacuum solution. It was also slightly tacky, so either something in the 3d print is inhibiting cure or we didn’t mix well enough. 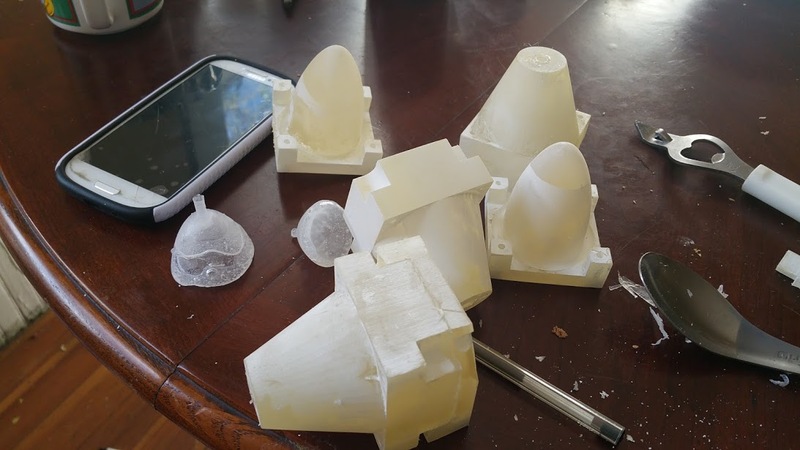 At the hackathon, we used syringes to eject into the molds until it came out the sides, and also just poured it into the bottom half of the mold and squeezed the top half on top to guarantee the mold was filled. 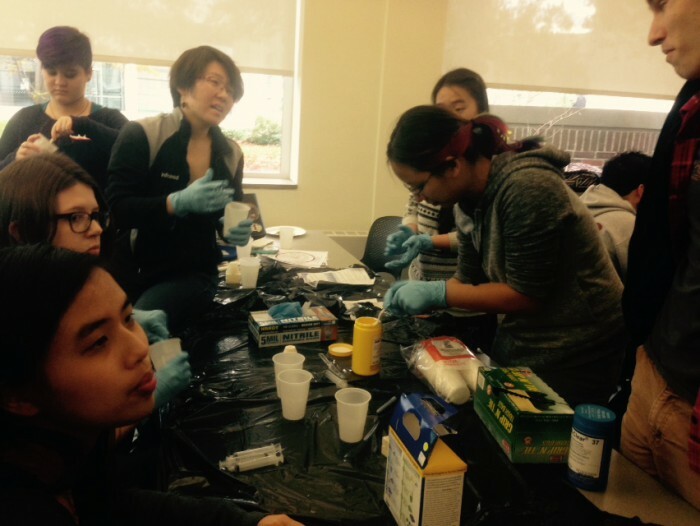 We also all got pretty excited about the idea of glittery menstrual cups! 🙂 Sadly I didn’t have glitter on hand. 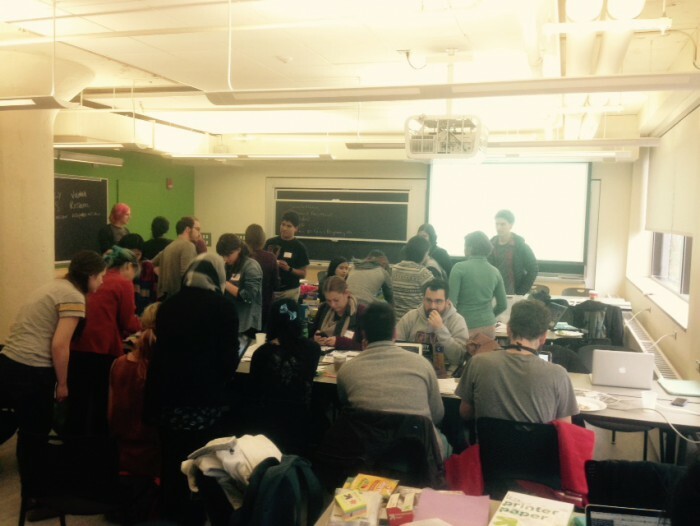 At the end of the hackathon we managed to demold one. This one also had a giant bubble and many little bubbles, and was also tacky after the full four hours of cure time. We mixed this one much better, so I’m starting to think something is inhibiting cure, or perhaps the place we left them was too chilly. I definitely need a better mold design, and I need to figure out why the silicone is not curing properly. I also need to figure out a way around the bubble issue. I also wonder how to analyze and determine why menstrual cups are failing (when they are hard to retrieve or leak). I also wonder, if fit is part of the problem, how you could easily take a measurement(s) to customize menstrual cups to each person.